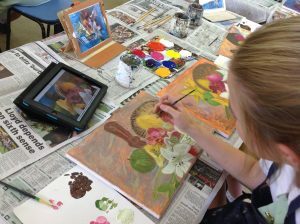 iPad Art Room » Use the iPad Camera… for more than ‘Photography’! Use the iPad Camera... for more than 'Photography'! The idea that camera functionality is tied to the production of 'a photograph' is a paradigm we need to move beyond when we are talking about mobile devices in arts education. 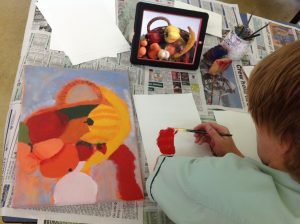 Let's use iPads and the connected camera in classrooms to be creative! 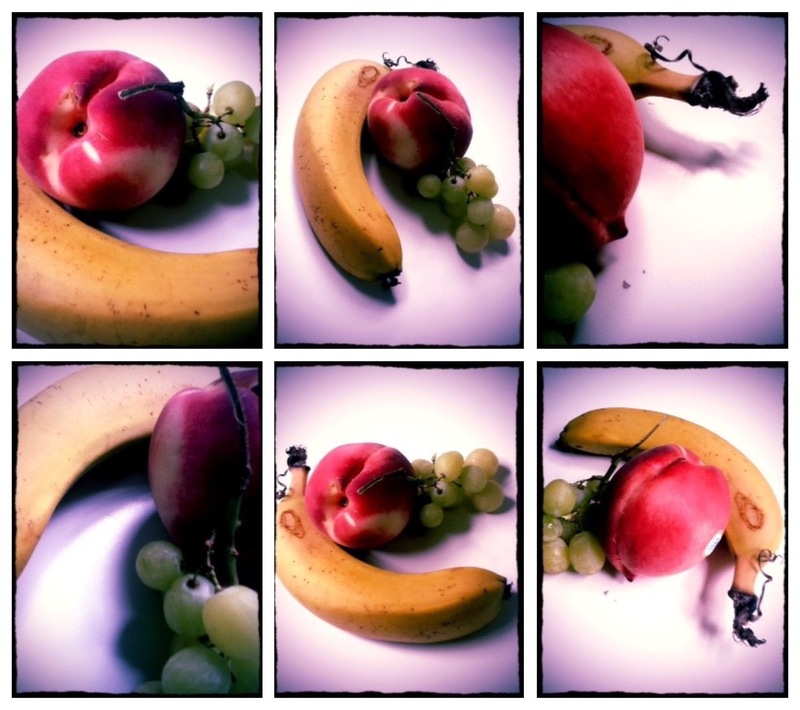 Use the iPad Camera… for more than ‘Photography’! Photography is (wonderfully) more accessible than ever. When our students have access to the connected camera that is an integral part of our creative mobile devices, the lens becomes an entry point, a conduit between what is placed before it and a myriad of other creative tools. We can go further. Through the camera, students can see their work, and their world, differently. Here’s some ideas that you can explore to extend the potential of that connected camera on your mobile devices for teaching and learning. Many teachers use photography and mobile devices to seek out or document objects for lesson resources. For example, students may shoot leaves as part of a photographic unit, a record of an investigation or as part of a research project. 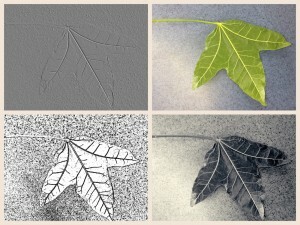 In these cases, using filters to transform photographs is usually a process of applying filters to images from the camera roll ‘post production’. There are some very different ways of working when we look at ‘live filters’. The images presented on the left were created by a teacher using a leaf to introduce very young students to the difference between light and dark, tone, outline and contour line. 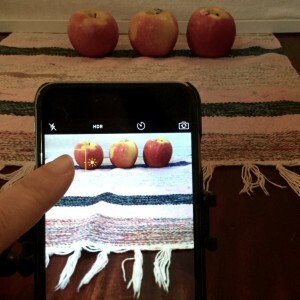 By hovering her iPad over a leaf on the floor, and flicking between live filters, she was able to demonstrate, in real time, the differences between these ideas. She had her iPad connected to a projector screen so all the students could see both the ‘real’ leaf and the changes that occurred as she moved between filters. She was able to engage the students in conversation, zoom in and out, and responsively manage her time. The magic of this moment was a valuable hook for students who were then challenged to find an object and develop a series of photographs that demonstrated their understanding of these concepts. By working through this really active process students were able to grapple with their understanding of what they could see, what they could not, and what they could change. Using apps that have live camera filters opens up very different creative opportunities. Simply hovering an iPad or phone over an object, pattern or surface, reveals creative potential. The colour, line and contours around students can transform, right before their eyes. It’s an inspiring way to work, and some great entry points for other for works are revealed. Pictures like the kaleidoscopic images being generated in the clip above may spark painting projects, tessellations, cartoons… Here you’re seeing an app called Kaleidacam in action, and the real-time reflections that can be manipulated to create amazing effects. For many students this way of working represents a engaging and entirely new way to begin the creative process. Check out this post on kaleido-creations to see what I mean. As in the image here, students can hover their live filters over their artwork and explore changes. 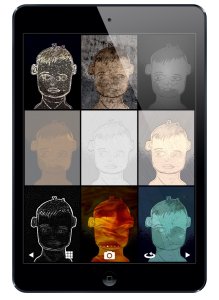 What you see in this screenshot is a portrait drawing through the lens, with the MegaPhoto app presenting a number of ‘changed’ views. These sorts of opportunities may help a student to move forward in the creative process, change directions, visualise a next step, etc. Sometimes if my students are stuck for ideas, encouraging them to get their phone out and ‘hover’ can help them move forward. If you’d like to give this sort of process a try, my two favourite ‘live camera’ filtering apps are MegaPhoto, and for younger students, OrangeCam. Now don’t get me wrong, I firmly believe that opportunities to think and design through drawing or sketching can be very worthwhile. However, I also know that for some students, projects that begin with ‘pencil planning’ can result in immediate and/or compounding barriers. Opportunities to explore alternatives to sketching during early production phases can boost the creative confidence of students who may believe that their ability to create is limited to their ability to sketch and render from life with accuracy. Sometimes students who have a ‘skill deficit’ when it comes to drawing frequently opt out early of a lengthy task, or they might not commit to, or get excited about, a multi-step process. They may believe that their capacity to succeed in following steps is compromised. In fact, they may be right; limited engagement through the planning stage can make it really difficult for students to produce a finished product that represents their true capacity. Many teachers rely heavily on a ‘routine’ of sketching and brainstorming early in tasks, even requiring students to submit finished sketches before going onto subsequent steps. There are digital alternatives that can provide entry point for students, rather than road blocks, tools that may allow them to show what they can do. By simply moving their device over a subject, the ‘live camera’ is full of creative potential for students. As the screen fills, a variety of ‘opportunities’ are revealed visually. By getting closer, moving further away, exploring angles, students are essentially exposed to a myriad of compositional choices. This is a great time for teachers to seize an opportunity to dive into an exploration of visual language and image construction. Although students can also use the digital zoom, physically ‘getting closer’ is somewhat of a departure from SLR-based techniques. Changing size, scale and manipulating the spacial organisation within the picture plane becomes a hands-on process. The combination of this immediacy and the ‘hands-on’ way of working can also result in an increased diversity and complexity of compositional trials compared to when students use preparatory sketches. In other words, it’s easy for students to experiment, so they often do! The camera gives students instant access to the compositions they can see in their minds eye, and importantly their experiments are recorded in the photo library for review. Student’s can learn about the concept of abstraction by ‘doing it’. Coming back to the kaleidoscope app I mentioned before, hovering this filter over a representational image breaks it apart. Students can use this tool over their own works, and instantly see the line, texture, colour etc take over from the shape and form of their familiar objects. New shapes, patterns and possibilities emerge, and often, so does an appreciation of the elements of art. 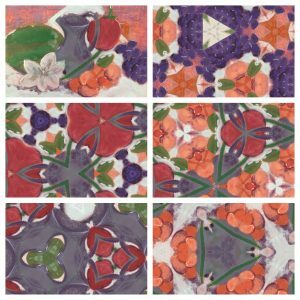 In this collection of images you can see a student’s representation painting, and a variety of photographic investigations, abstractions created with the kaleidoscope camera.